Dining 135 metres above the city on the renowned Coca-Cola London Eye is the most exclusive experience to date. This iconic landmark is not only the world’s tallest cantilevered observation wheel but also a unique setting for intimate events and bespoke dining experiences. At rhubarb we have taken dining to new heights, drawing on years of expertise as a premium events caterer across some of London and the Home Counties’ most famed locations. We are proud to offer an on-board catering experience that promises to delight and inspire, delivering not only incredible food and drink but the decoration, service and atmosphere to match. Soaring high above the capital, the London Eye’s private capsules can be adapted to suit your every event need. Available to hire from two to eight people, guests can enjoy a deliciously different canapé reception and luxury three-course, sit down meal whilst gliding over London’s most majestic landmarks and soaking in the stunning surroundings. rhubarb’s expert planners are on hand every step of the way to ensure your bespoke event is brought to life. They work closely with our creative culinary team who carefully craft bespoke menus full of exquisite dishes such as: blood orange cured salmon, sea purslane and avruga caviar canapés; red wine braised lamb shoulder, roasted heritage beetroot, celeriac, sweet potato gratin, baby spinach and roasting juices; chocolate sphere with chocolate mousse, honeycomb and chocolate sauce, to bring you an elevated dining experience. 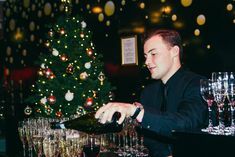 Greeted by friendly staff, you will enjoy champagne and canapés in the exclusive Eye Lounge, the London Eye’s very own champagne bar. You are then invited to continue your journey on to your stylish London Eye capsule. The capsule is always laid out in style to suit you, with an oval table, beautiful floral arrangements, candles and music of your choice, as well as personal waiting staff to look after you for the entirety of your special evening. A 360 degree rotation lasts for 30 minutes and as the first begins, starters are served to be enjoyed whilst taking in the sights and London’s lights below. The evening continues with the main and desserts being delivered over the course of the full three rotations, stopping on the final rotation high over London’s skyline for a Champagne toast as you descend with coffee and petit fours; ending the experience with true rhubarb elegance. 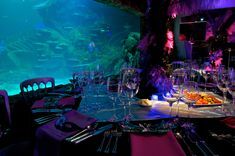 At rhubarb we strive to deliver exceptional events. Anywhere. The word ‘impossible’ is simply not a part of our vocabulary and the London Eye is the perfect example of this. It would seem a rather considerable feat to provide a menu of both hot and cold dishes to a moving venue with no kitchen, yet the process runs smoothly time and time again. This is due to have an excellent team both front and back of house, fantastic communication and above all, incredible food. Dining at the London Eye is a once in a lifetime experience and we would love to make your private event truly memorable. Please send your event enquiry to events@merlinvenues.com and the team will be happy to help.